In Thirty Kingdoms players take on the mantle of the ruler of their own kingdom as the head of a Noble House, starting with a handful of provinces under their control their ultimate goal is to expand their borders, laying control to as much of the map as possible, and competing against 29 different players. The game is very PVP focused, though the early rounds will try merrily focus on PVE with players battling against Barbarians and adding their territory to their own kingdom, but ultimately the game becomes a PVP competition is the various Houses battle against each other to claim their position at the top of the rankings for both their map and the game itself. 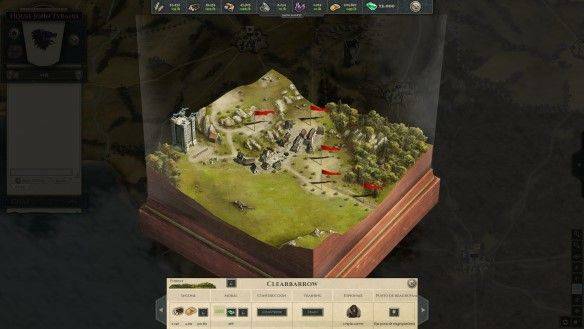 Early game revolves around gathering resources from a variety of resource production buildings that a player can constructs in one of their provinces, each province, giving access to different resources to help the player build up their Empire. The map itself is made up of over 100 different provinces, with 30 different Player Houses are vying for the same territory, It isn’t a long until rival neighbouring Houses begin to clash over border disputes and wanting to expand their territory. The game isn’t completely focused on destroying your opponents, and players have a number of other options are to try and achieve what they want from the game, by constructing a Marketplace players are actually able to trade with each other and buy and sell resources. There is a wide selection of diplomatic options also available to each Noble House, such as allowing players to pass through your territory unhindered (when normally entering a rival players territory will begin a war). As well as creating an Alliance where players are able to more freely exchange resources and military protection with each other, but will often result in larger Alliance versus Alliance wars. With so much going on on your chosen continent, the game offers a unique Newspaper feature where each day players are updated constantly with the actions of the other Player Houses, including buildings that they have constructed in their provinces, attacks and declarations of war that have been made, the forming of alliances and players are even able to publish their own articles and use the News as a noticeboard leaving messages for other players to see (with a VIP subscription players are also able to post images with their articles). Whilst the game is completely free to play and players never need to spend any money they always have the option of purchasing the Premium Currency in the form of Emeralds, which can be purchased with real cash through the in game store. Emeralds offer a variety of different options to make the game a little easier, without being overly game breaking, and those that don’t want to spend any money can still earn them through the completion of surveys, signing up for websites and downloading external apps outside of the game.